The Best Ice Hockey blogs from thousands of top Ice Hockey blogs in our index using search and social metrics. Data will be refreshed once a week. Also check out Top Ice Hockey Youtube Channels list for Top videos on Ice Hockey. 2.38 Not Your Average Hockey Blog. Ice Hockey newsletter is a comprehensive summary of the day's most important blog posts and news articles from the best Ice Hockey websites on the web, and delivered to your email inbox each morning. To subscribe, simply provide us with your email address. Montreal, Quebec, Canada About Blog All Habs is a digital hockey magazine with a primary focus on the Montreal Canadiens. It is known as a trusted source for Habs news and in-depth analysis giving passionate fans their daily dose of all things related to their favourite team. Facebook fans 42,092. Twitter followers 68,416. Canada About Blog The Hockey News gives you the inside scoop on hockey like no other publication - interviews, photos, stats and predictions. Team stories from the best writers in all 30 NHL cities. Coverage of minor pro, college and junior leagues. Weekly features that take you inside the game. Facebook fans 280,875. Twitter followers 260,668. Zurich, Switzerland About Blog International Ice Hockey Federation (IIHF) is a federation of member national hockey associations governing the sport of ice hockey and in-line hockey for both men and women. The objectives of the IIHF are to govern, develop and promote hockey throughout the world . Facebook fans 253,208. Twitter followers 113,783. Canada About Blog How to hockey is dedicated to helping you improve your hockey skills. This site is a resource for tutorials that will help you to learn the basics of hockey, along with regular posts that contain more advanced tips, drills, exercises and more. Facebook fans 70,082. Twitter followers 10,185. Montreal About Blog The Hockey Writers bring you local insight from all teams and a wide perspective of league events. THW is one of the largest and most respected hockey sites, ranked 3rd in the world for hockey only content. Featuring 140 writers covering all 30 NHL clubs. Facebook fans 24,054. Twitter followers 23,372. United States & Canada About Blog The American Hockey League is top development league for all 30 NHL teams. This blog is for news, scores, photos and videos, contests and more. Facebook fans 124,910. Twitter followers 88,699. Cambridge UK, Airports About Blog Hockey Tutorial is creating and sharing the highest quality product overviews, reviews and motivational hockey videos from around the world. It aims to grow the sport with a wide range of instructional videos giving any potential player the means to learn the sport from anywhere . Facebook fans 21,406. Twitter followers 7,059. About Blog Comprehensive up-to-date coverage for ice hockey, aggregated from news sources all over the world by Google News. Facebook fans 21,826,400. Twitter followers 212,817. About Blog A community of millions of ice hockey fans engaging in the creation of content and the sharing of conversation across tens of thousands. Facebook fans 1,078,333. Twitter followers 464,149. Pittsburgh, Pa. About Blog Chipped Ice blog is an account of Trib Total Media. All of the Tribune-Review's Penguins coverage that might not fit in print. It covers Pittsburgh and Western Pennsylvania news, sports, politics, entertainment and more. Facebook fans 62,740. Twitter followers 60,003. About Blog Ice hockey fights from all leagues from the old ISL to the EIHL, EPL, BNL, NIHL to the North American minors and Juniors. Facebook fans n/a. Twitter followers 4,781. UK About Blog British Ice Hockey is the best place for all of the latest breaking news, features, results and rumors from across the Elite League, Premier League and National Leagues. Facebook fans 26,286. Twitter followers 25,529. About Blog A blog is on latest news, game recaps, stats, features and more about ice hockey. The first place to find college hockey stats, the birthplace of Vote for Hobey, a college hockey fan forum and original columns. Facebook fans 8,886. Twitter followers 28,376. Seattle, WA About Blog Icethetics is a blog devoted to the aesthetics of hockey. They discuss and cover news related to logos and uniforms. Facebook fans 3,961. Twitter followers 13,264. Toronto, Ontario About Blog The Leafs Nation blog shares the pain and disappointment of being a Leafs fan through analysis, news, videos and humor. Facebook fans 2,464. Twitter followers 9,220. Boston About Blog The official hockey blog of the Daily Free Press. The Daily Free Press is the independent student newspaper at Boston University, covering BU and Boston since 1970. Facebook fans 3,122. Twitter followers 6,893. Ottawa, Canada About Blog Hockey Analysis blog is strive to give a better understanding of the game of hockey through the use of statistical analysis. Facebook fans n/a. Twitter followers 6,381. Nashville, Tenn. About Blog On the Forecheck is #1 independent source for Nashville Predators news & analysis. Look for all the latest from around the mainstream media and leading hockey blogs, as well as original analysis related to the Preds and the NHL at large. Facebook fans 3,066. Twitter followers 5,736. British Columbia, Canada About Blog The Magazine for Ice Hockey Goaltenders. InGoal News are the world's most-read goal-tending resources. Facebook fans 34,931. Twitter followers 17,933. About Blog Follow this blog for News, analysis and opinion from the fan perspective. Facebook fans 1,102. Twitter followers 10,338. 43.67915, -83.48515 About Blog Hockey World Blog is dedicated to giving you important news updates along with unique opinions on some of the hottest topics in the hockey world today. They also offer important Fantasy hockey updates and suggestions along with videos of some of the dirtiest dangles, smoothest goals and bone-crunching checks from NHL and hockey leagues all around the world. Facebook fans 5,974. Twitter followers 1,620. Winnipeg, MB About Blog This blog is covering the latest news and opinion around the new Winnipeg Jets franchise. Facebook fans 1,565. Twitter followers 4,294. Terrace, BC About Blog Greatest Hockey Legends shares hockey history and memories to keep alive. Specially contents of player biographies and special features of hockey. Facebook fans 1,411. Twitter followers 3,314. About Blog A blog dedicated to providing helpful information and insight for youth hockey coaches. Ice Hockey Systems Inc. provides coaching tools and resources to youth ice hockey coaches. Explore over 500 animated hockey drills, systems, and coaching videos from Denis Savard. Facebook fans 4,498. Twitter followers 3,963. Massachusetts, USA About Blog The Mack Report delivers up to date, breaking and relevant sporting ice hockey news from Merrimack College athletics. Facebook fans 1,172. Twitter followers 958. Winnipeg About Blog A Winnipeg Jets blog fueled by passion plus some other emotions which are weird and deeply confusing. Facebook fans 146. Twitter followers 3,256. About Blog The Color Of Hockey blog is about stories and posts covering the history and growing impact of people of color in hockey - from pee wee to the pros. Facebook fans 168. Twitter followers 941. About Blog The official National Hockey League youtube channel. The official source of everything you need and want to know from the National Hockey League. Facebook fans 4,304,982. Twitter followers 5,406,858. Lee Valley Ice Rink About Blog The London Raiders are a competitive mens ice hockey team based in London playing out of the Lee Valley Ice Centre in the NIHL South Division 1 League. Facebook fans 2,670. Twitter followers 1,881. About Blog Pro Hockey News is a one stop shop for news across the hockey world. From the NHL, to US College hockey, to Canadian Major Juniors, to Europe, and more. Facebook fans 1,525. Twitter followers 5,450. Boston About Blog Hooked on Hockey Magazine is an online only hockey magazine that focuses on exclusive segments and content not covered by any other hockey site out there. Aside from NHL coverage, HOHM also covers the World Junior Championship, Olympic Hockey, World Championship, and numerous other pro-leagues. Facebook fans 164,482. Twitter followers 6,334. The Interwebs About Blog Formerly known as Redskin Warriors, the Blog of Brotherhood brings you the same content and all-things Miami Hockey. This blog is not endorsed by, affiliated with, or published with the approval of Miami University. Facebook fans 276. Twitter followers 1,663. Iowa, USA About Blog The United States of Hockey is a blog about hockey in America. It focuses on USA Hockey, U.S. National Teams, American hockey prospects, college and junior hockey, and the growth of the game. Facebook fans 906. Twitter followers 15,793. Las Vegas, NV About Blog Street hockey gear is one of the top amazon affiliated online hockey equipment store. Get updated with the latest hockey news all around the world and also reviews on best hockey equipment brands based on research. Facebook fans 20. Twitter followers 3. About Blog Uncensored Hockey Talk For Hockey Fans. Facebook fans 220. Twitter followers 1,290. Australia About Blog Ice Hockey Australia has six state member ice hockey associations and is the recognised governing body for ice hockey in Australia. IHA is affiliated with the Australian Sports Commission (ASC), and Australian Olympic Committee (AOC), and is an active member of the International Ice Hockey Federation (IIHF). Facebook fans 4,947. Twitter followers 5,424. United States About Blog USA Junior Hockey Magazine features the best in US Jr. hockey news. USAJHM is the home of future in college and NHL hockey stars. Facebook fans 1,624. Twitter followers 6,747. 38. Not Your Average Hockey Blog. About Blog This blog strive to make sure the reader gets accurate and important information about hockey team.The view from all sides of the game. Facebook fans 235. Twitter followers 304. About Blog Nick Does Hockey blog shares rollicking journey into a very foreign sport. Philadelphia About Blog Center Ice Hockey Magazine was created to entertain and inform hockey fans and players of all ages. With the rapid growing interest in hockey in the Delaware Valley, this publication serves as a medium to provide an abundant supply of hockey knowledge and information. Facebook fans 89. Twitter followers 3,465. Canada About Blog Hockey Blog In Canada shares latest news related to ice hockey. Facebook fans n/a. Twitter followers 856. Toronto, ON About Blog HJC is a blog that run just for fun. A place where readers can come and see hockey jersey concepts that other readers have created. Facebook fans 898. Twitter followers 490. Fredonia, NY About Blog Fredonia Hockey blog is all about ice hockey news, events and schedules. Facebook fans 835. Twitter followers n/a. New Hampshire About Blog Welcome to The UNH Men's Hockey Blog, come on into the cold. A Blog about the best college hockey program in the world The University of New Hampshire Wildcats. Here you will find UNH Hockey News, Stories, Stats, Recruits and more. About Blog The Terrier Hockey Fan Blog shares BU hockey fans with a cornucopia of information about the present, past and future of Terrier hockey with a focus on player features, program news and opinion. While the major focus is not presenting game accounts, schedules, stats or standings. Facebook fans n/a. Twitter followers 450. Boston, MA About Blog A blog that brings you all the news you need to know about BU hockey. This includes pictures from the games,recaps, and other news, stories and anything else going on in the world of Terrier hockey. Facebook fans 356. Twitter followers 2,931. Brockport, NY About Blog Brockport is a four-year, state-sponsored college located in upstate New York near Rochester. The college has 9,000 students and 23 Division III sport teams, among them the Golden Eagles ice hockey team. Facebook fans 615. Twitter followers 477. Ireland About Blog Murph On Ice offering expert coverage and interviews on UK & Irish Ice Hockey including EIHL, IIHF and NHL. Facebook fans 372. Twitter followers 7,416. Fairview, TX About Blog Barry The Blogger - Follow me on twitter at @allenamericans1 and/or like my Facebook page at Allen Americans Blog. This is not the official blog of the Allen Americans. Facebook fans 497. Twitter followers 1,054. New York About Blog An on-line magazine that focuses on all amateur, all hockey, all New York State. Facebook fans 759. Twitter followers 540. British Columbia, Canada About Blog Celebrating the great Canadian game. Tracking the NHL, the Canadian teams and a lot more! About Blog My name is Steve Currier, and I'm the creator of Golden Seals Hockey, Home of the legendary California Golden Seals and the Hockey Hall of Shame. New York City About Blog The Hockey Foundation is a charitable non-profit that changes lives around the world via hockey, one puck at a time. Hockey Foundation has been supporting communities in the Indian Himalayas through ice hockey, and in that time have coached over 2,000 children and donated over 6,000 pieces of hockey equipment. Facebook fans 2,086. Twitter followers 1,934. Pittsburgh, PA About Blog The greatest place to find engaging and funny hockey content and hockey tips and tricks to improve your game. Facebook fans 33,100. Twitter followers 9,651. California About Blog The hockey blog from Ice Warehouse features equipment sneak previews, hockey product reviews, and everything hockey gear related. IW Hockey is the best online retailer for ice and roller hockey equipment. Facebook fans 51,395. Twitter followers 2,649. Holliston, MA About Blog Pure Hockey is the largest ice hockey equipment retailer in the USA, with 22 stores and online website. Facebook fans 115,817. Twitter followers 12,211. Section U About Blog Your Source For All Things UMass Hockey. Longtime UMass fan sharing about Minuteman hockey and other interests. Noted beer snob. Facebook fans 371. Twitter followers 1,833. About - British Ice Hockey is the best place for all of the latest breaking news, features, results and rumours from across the Elite League, National Leagues, Women's game and Team GB. About - Get the latest news on the GB national teams, including GB Men, GB Women, U20s Men, U18s Men, U18s Women, U16s Men & U16 Women. About - The Great Britain Ice hockey Supporters club – The Home of the Fifth Line. The Great Britain Ice hockey Supporters club was formed in June 1993. The formation was the brainchild of Annette and Allan Petrie. 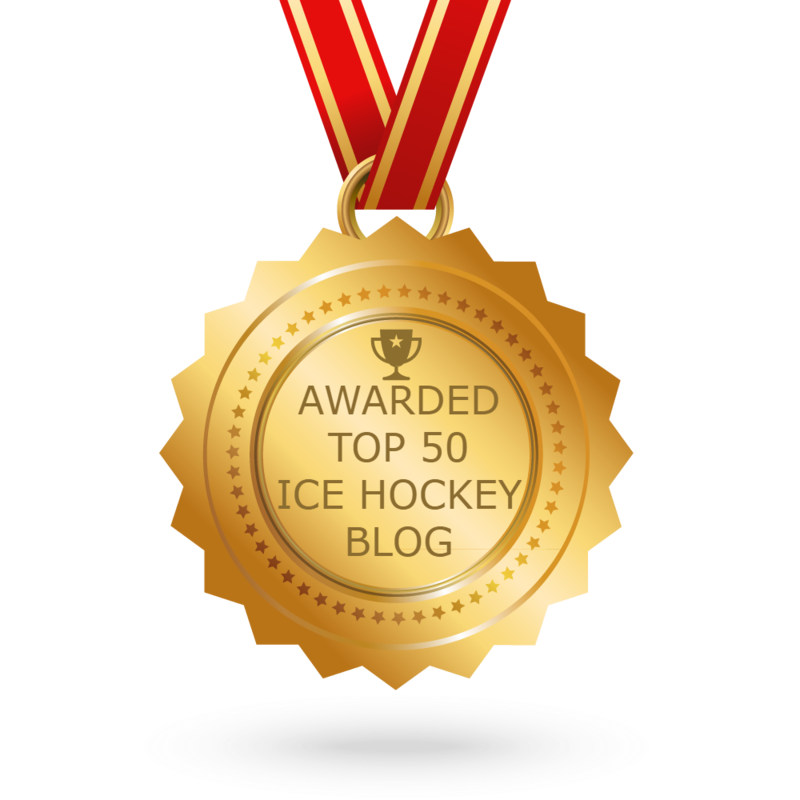 CONGRATULATIONS to every blogger that has made this Top Ice Hockey blogs list! This is the most comprehensive list of best Ice Hockey blogs on the internet and I’m honoured to have you as part of this! I personally give you a high-five and want to thank you for your contribution to this world.